Iranian University Protest: "We Wish We Were Columbia Students"
Iranian university students protested again on Tuesday outside of Allameh Universtiy. 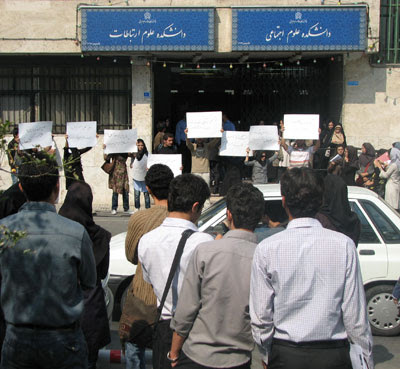 NCRI – On Tuesday, students suspended by the Allameh University administration gathered outside the school campus. The students were from Economics, Humanities, and Literature colleges. They carried signs reading “Wish we were Columbia University students”, “Our sin is being conscious”, “Who is responsible for illegal acts of the university administration”. The university security forces intervened and prevented the students from gathering outside their college on the campus of the Allameh University. The students called that the university president complies with their demands. Are you sure you want that, kids? It may be quite a culture shock. Judith Apter Klinghoffer at History News Network has much more on the deteriorating conditions in Iranian society.